March 16, 2009 by M. Clark. When playing a better player, they always seem to have you in the back corner, making you boast the ball or hit a poor shot, which they then put away. When you put them into the same corner, at the back, they seem to be able to send the back immediately back into the same corner! (1) When playing the shot, make sure you only have one foot inside the line of the service box. Two feet means you are too close to the ball and the wall. (2) Try to make sure that you place your body and head so that you can see the back of the ball. Shoulders square to the side wall. (3) If the ball is very tight, shorten your swing. 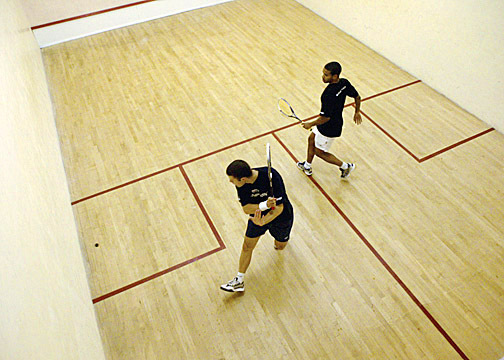 Keep the racket closer to the ball and aim a small swing at the ball high onto the front wall. (4) Adjust the height and power so that the ball stays high, away from your opponents volley. It will have a chance of fading at the back, making it hard for your opponent. Adjust the shot, getting it closer to the area where it will bounce and then fade at the back. Most of the best players at my club still over hit the ball, aiming too low and hitting too hard. (5) The forehand is harder as we all tend to play the shots with shoulders more to the front wall. Turn the hips/body first and keep shoulders square on to the side wall as you move, but the points above then still apply. (6) Get really low to the ball with the shorter swing and aim high and soft onto the front wall. Driving from the back corners. boast: hitting the ball onto the sidewall first, then it will hit the front wall, before landing in court near the opposite corner. An effective attacking shot, or a very weak defensive shot! fade: the ball landing on the floor, going onto hitting the side wall, so that the energy is taken off the ball, causing it to be difficult or impossible to return, depending on your opponents ability.